This issue introduces the "Psylocke Crush" subplot, a minor subplot in which Cyclops' finds himself awkwardly attracted to Psylocke, and Psylocke seems to take some measure of pleasure in that fact. 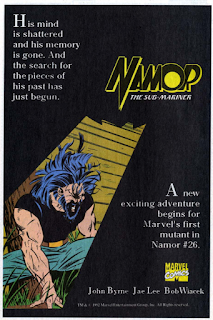 It mostly gets handled by Fabian Nicieza over in X-Men, and never really culminates in anything before quietly going away, which Nicieza says was his plan all along. Iceman's girlfriend Opal, last seen in X-Factor #65, returns in this issue. She is once again shown receiving a mysterious letter before going out with Iceman, a setup for a plotline featuring her in the next two issues. 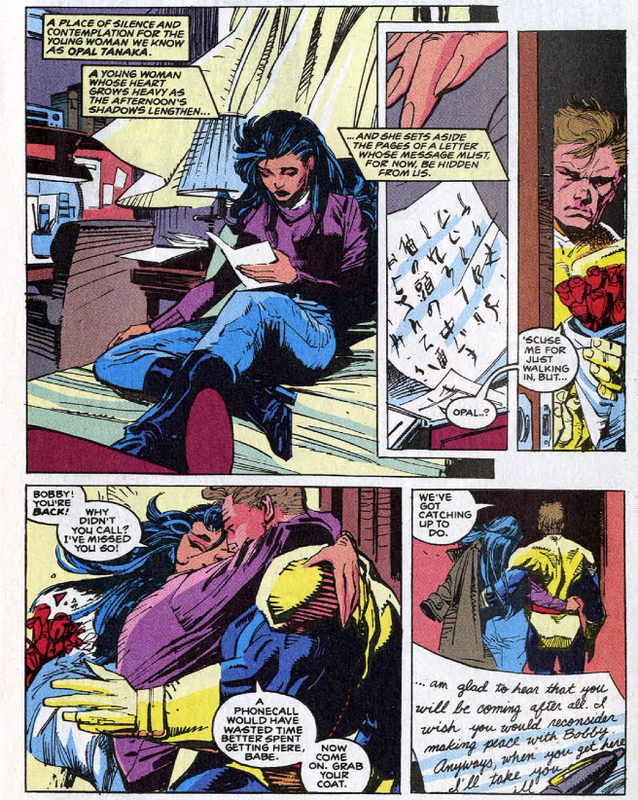 Also, for some reason, she's now living in suburban New Jersey despite having a New York apartment in X-Factor. The X-Factor supporting cast reunion continues (nice to see Lee & Portacio bringing back these Simonson Era characters) as Archangel listens to a message left by Charlotte Jones, after which he strips naked and flies off into the sky, part of the ongoing "Archangel struggles with his humanity" subplot. Of note, he is shown here to be capable of retracting the entirety of his wings into back, appearing entirely human (aside from the blue skin). Andy Kubert, still keeping a foot in the X-office prior to his assignment as the regular penciler on X-Men, fills in for Portacio this issue. 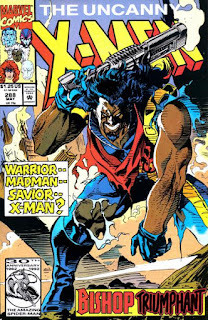 He's inked by former New Mutants artist Bill Sienkiewicz. It's not the best combination, as Sienkiewicz seems to bring out the scratchier side of Kubert's pencils (and I never really embraced Kubert's art until it started getting a little smoother later in his X-Men run). Some of the darker, moodier art here works, but more often than not, things are murky and hard to follow. John Byrne receives scripting credit alongside Scott Lobdell; presumably he contributed some dialogue to some of the pages before getting booted off the assignment (the opening pages with the male X-Men mock fighting each other sounds like Byrne, but I could be wrong). The chronology between this issue and X-Men #8 is a little dicey - here, Bishop seems to be meeting Cyclops for the first time, but in X-Men #8, he's introduced to a bunch of X-Men (including Cyclops), some of which, like Forge, he's seen hanging out with in this issue without comment. So chronologers consider this issue to take place after X-Men #8, with Bishop's shaking of Cyclops' hand here a gesture of respect moreso than a first time greeting. Iceman appears here de-iced wearing one of the blue-and-yellow team uniforms instead of his individual blue-and-white one - though certainly it's within reason to assume the X-Men occasionally don one of the old uniforms. 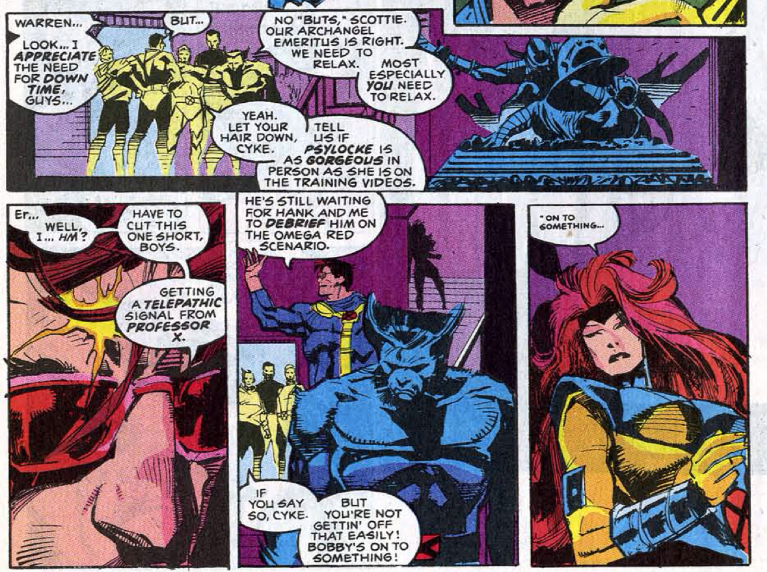 In an odd bit of dialogue, Iceman asks Cyclops if Psylocke is as gorgeous in person as she appears in training videos, despite the fact that they live in the mansion together and surely have crossed paths in person at this point (I can think of two specific instances in which they were seen on-page in the same room: Uncanny X-Men #273, and the briefing scene in X-Men #5). I can buy they maybe don't hang out or talk much, but he's seen her in person himself, at least. Cyclops mentions that Xavier is waiting for a debrief regarding the Omega Red scenario from X-Men #4-7. In the wake of his battle with Styglut, Bishop is sternly told the X-Men only take the lives of their enemies in extreme circumstances (Colossus is presumably thinking of Proteus), and the importance of protecting innocent bystanders (something Bishop never had to worry about in his time) is stressed. A house ad for John Byrne's Namor series touts the character as Marvel's first mutant; I believe it was around this time (in the early 90s with onset of that series) that Marvel retroactively decided Namor was a mutant (in an attempt to tie him in with the sales superstar X-Men), a distinction that has stuck and which led to Namor having a semi-regular role in the X-books during the 00s. Stan Lee's column discusses the upcoming X-Men animated series, though he says that James Cameron will be involved in the effort (and I don't believe that turns out to be true). He also pimps the live action X-Men and Spider-Man movies, which are still about ten years away from actually hitting theaters. Of note in this month's Cool-o-Meter, new series Nomad is cool (it's really not), Aliens 3 & "Operation: Galactic Storm" are in the middle, and 19-part crossovers (ie "Operation: Galactic Storm") are uncool. The Bishop Integration Tour continues, picking up where last issue left off by showing Bishop begin the process of acclimating himself to being one of the X-Men. His termination of Styglut, the last remaining Fitzroy escapee (aside from Fitzroy, and Bantam - and yes, Mountjoy -) makes for an effective device to that end: it closes out his responsibilities as one of the XSE as he becomes an X-Man, while also serving as an object lesson for the X-Men's "no wanton killing" and "watch out for bystanders" policies. In fact, for as much as this era of comics (rightly) gets a lot of flak for shoving kewl new characters down readers' throats, Bishop's integration into the team has been handled with a surprising level of care. We already know more about him, for example, then we do Cable, who's been around far longer, and Lee & Portacio seem much more interested in making readers care about Bishop as a character, as much for his big guns and take-no-prisoners attitude. How well they succeed in that regard is, of course, a matter of opinion, and the relatively deft hand they're playing at this point will grow increasingly less deft after they shortly leave the books and Bishop mostly fades into the background, only to pop up with the occasional "in my time, things were like __!". But for now, they're handling the introduction of a new character and team member remarkably well, especially given the era in which they're working. Tomorrow, we meet the Externals (...) in X-Force #10. Friday, the MLF strikes in X-Factor #78. Next week, Unstacking the Deck: Jim Lee X-Men cards edition! And Riptide. Though that one maybe was less "had to" and more something else. Um... exactly how in the know they were of Wolverine's activities in and around Madripoor at the time? Good call on Riptide. 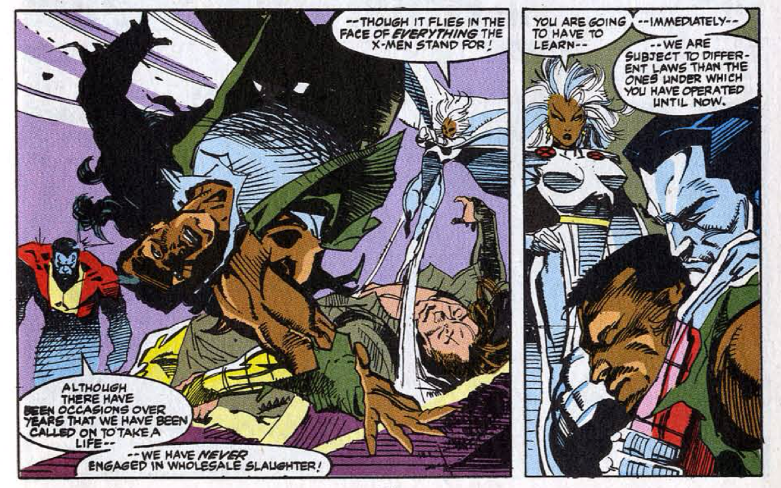 It's probably coincidence, but I do like that Colossus (with two "uncharacteristic" deaths on his hands) is the one helping Storm make the point. As for Wolverine, his history of killing and the X-Men's objections to it is pretty long-standing (and he's spent plenty of thought bubbles fighting the urge to kill). They probably aren't as aware of his recent Madripoorian adventures as they should be, but at the same time, much of that was done as Patch (technically if absurdly) and not Wolverine, so it's didn't really besmirch their name. If nothing else, Wolverine is the exception that proves the rule, and could serve as an object lesson for Bishop - "yes, he's a valued member of the team despite being a little more gung-ho on the killing side than we'd like, but we don't want you to emulate him. Emulate everyone else". "Not this team though. The Blue team. The cool team." Yeah, it's just that I just finally got around to read the early WOLVERINE issues, and Colossus' speech here clashes _a bit_ with "Patch" lethally wading through an army of mooks in every other issue. The X-Men don't kill named opponents (see: the Outback era Brood story). Apropos read with hindsight it's pretty apparent he didn't really fool anyone with his patch, and anyways it's says "WOLVERINE" right there in the book title. Which btw is whole another sort of crazy: I was supposed to be a huge Wolverine fan back in the day but yet I failed to catch any of his solo stuff for the first three years they were publishing it, and even now with having had Marvel Unlimited for more than a year I didn't get around to read but single issues. Until now. As part of a Jessica Drew binge. Your point about it being specifically Colossus to say it is a good one. I would like to think it's not perfectly coincidental that it's him, as when you start thinking of uncharacteristic X-Manslaughters, our Russian metallic usual suspect comes first to mind. As the first high-profile example of course is Proteus, as you pointed out. But, when you think some more, barring Wolverine is there really anyone else? 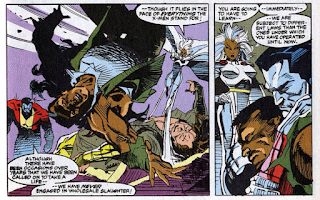 Storm stabbed Callisto in the heart once, and has that one pre-X-Men experience; Rogue kind-of murdered Carol Danvers before joining the X-Men but she got better... there really isn't anyone but Colossus, is there? The Brood doesn't count. A body kind of wants to make something of his using "we" here. "We", Colossus? Unrelated question: I've been thinking of taking the plunge and buying (presumably cheap) back issues of Classic X-Men for the Claremont-penned back-ups. I'm aware that many of the earlier issues have, in addition to the back-ups, new pages included in the main story to flesh certain things out. Are those included in the trades that collect the back-ups? If not, are the extra in-story pages good enough to warrant tracking down the individual issues? The trades don't include the new pages. The additions do flesh certain plots out (#4 explores an incident mentioned in UXM#110. #8 reveals the identity of 'The Council of the Chosen'. The Alpha Flight storyline adds scenes of the Canadian Government being pressured to let go of Wolverine). Wish to note that CC's final back-ups- the 'Colossus returns home' (#29), the 'Mr. Sinister/Young Scott' two-parter & 'Phoenix meets Death' (#41-43) aren't included in the trades. I should note the add-ons end with #27, and the aforementioned stories are the only CC back-ups after that. The Claremont/Bolton backups are definitely worth seeking out. I know there's some trades out there, but they miss the last few Claremont penned ones, and I'd love to see a big thick hardcover that puts them all together in one place on fancy paper. As for the added pages, like angmc43 said, they fill in some little details, but I find them mostly useless and ultimately distracting (they tried to make the new art match the old art, but it's nonetheless jarring when you go from Cockrum or Byrne to Kieron Dwyer). Am I the only person that originally thought that the whole battle with Styglut took place in the Danger Room? I mean, it didn't- if you look carefully at the final sequence you'll see Bishop's clothes are different- but I thought it was confusing. No, I've seen other people express a similar sentiment online. "and never really culminates in anything before quietly going away, which Nicieza says was his plan all along." 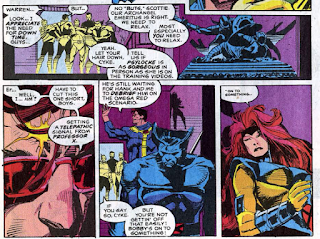 Sadly, it does get tied into the whole Kwannon nonsense, as Nicieza uses that to justify Lee introducing that plot to begin, and explain why Psylocke was aggressively flirting with Scott. "Of note, he is shown here to be capable of retracting the entirety of his wings into back"
Also, the whole Danger Room/Holodeck comparison aside, when did the X-mansion become a Federation starship? "Computer. Freedom". And the wall of his bedroom just opens up? 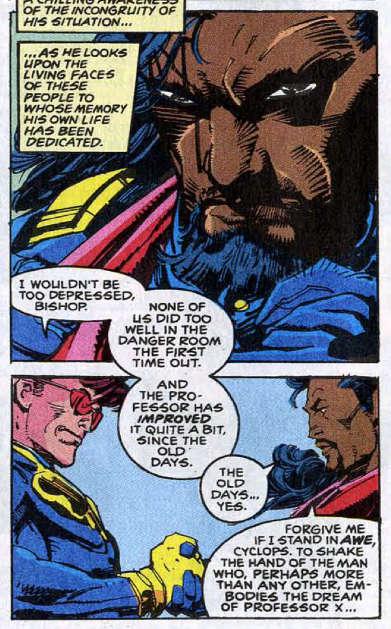 I mean, I get the mansion must be kitted out nicely with all the Shi'ar renovations and whatnot, but...ok then. "Iceman asks Cyclops if Psylocke is as gorgeous in person as she appears in training videos"
Yeah, that doesn't make sense. Even if they don't hang out or talk much, that mansion isn't that big that they'd never run into each other at some point. Of course, given how cliquey and segregated the cast will become over the years, it really is some funny foreshadowing (which I am sure others on here will insist it was planned all along or something). The art is ok. I've always been more of an Adam Kubert fan over Andy Kubert. Something about Andy's style - the poses his characters strike, the facial expressions, the overacting and emoting - never quite clicked with me. I do agree that his art gets better on this title once it gets smoother (circa #50), but that might be due more to the inking and better production values we get around then, too. As for the story...it does a perfectly cromulent job of integrating Bishop onto the team. I do feel Bishop was pushed hard by the X-offices even after Lee & Portacio are gone. He certainly does get as much, if not more, screen time than some of the other characters will over the next few years. And by this point, Bishop has appeared on the cover of this title more than just about anyone but Storm. Hard push indeed. Of course, given how cliquey and segregated the cast will become over the years, it really is some funny foreshadowing (which I am sure others on here will insist it was planned all along or something). Nah, this lot couldn't long-term plan even if Jean Grey herself came from the future on a video and told them how it's gonna go. But that's pretty much the end of it, right? And the wall of his bedroom just opens up? I mean, I get the mansion must be kitted out nicely with all the Shi'ar renovations and whatnot, but...ok then. They're definitely pushing him hard, but with last issue and this one, they're at least doing some character work with him to help sell the character as something more than a stock type, which is nice. "But that's pretty much the end of it, right?" The Kubert/Sienkiewicz art looks pretty good in places — in others, though, not so much; there are some wonky layouts, Cyclops’ torso on Pg. 2 is horribly deformed, Bishop’s facial hair goes missing on the last page of the battle scene, and feet are conspicuously avoided almost everywhere. Starkings throws in some very Orzechowki-like stuff, from the “Unff!” and “Wa-hooo! !” on Pg. 3 to the shapes of the balloons and their connectors overall. and feet are conspicuously avoided almost everywhere. An aversion to feet is definitely something Kubert shares with the Image guys. I've, always, had mixed feelings about the art in this issue. As much as I love Bill Sienkiewicz's work, as an inker, he tends to be a little too overpowering and the art comes out looking a bit too murky. I had the same problem when he started inking Sal Buscema on SPECTACULAR SPIDER-MAN during the Clone Saga. I agree; Sienkiewicz on Buscema in SPECTACULAR was really ugly. Their styles just didn't match at all. I never understood fully what Archangel was meant to be and how his wings were meant to act, given that they change between teams. 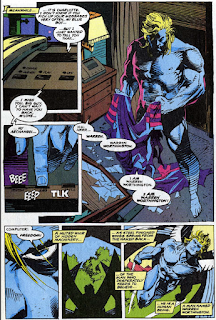 It seemed at first that his blue and purple costume was his actual skin, since he never took his "mask" off, even when wearing a suit in one issue of X-Factor. But then when he re-joined the X-Men he stopped wearing the mask entirely and had hair. I've also seen his metal wings presented as a number of ways. One is that they're always there and can never retract. Another is that the "feathers" can retract into the frame of the wings, but the frame is always there. Then, most notably with Andy Kubert, his wings can just disappear completely. I understand that it would be more functional for his wings to not be there all the time, but I like the concept that these metal things are always there and are a reminder of his missing humanity. It seems like they disappear out of convenience, like in big group shots or where a background needs to be shown. Hmm, why do I get the impression that was written to shut me up...?